Stay at the Disneyland hotel in Anaheim CA, or the other Disney hotels - Paradise Pier Hotel or the Disneyland Grand Californian hotel. These 3 downtown Disney hotels offer the best Disneyland California vacation experience, but are also the most expensive of the Anaheim hotels near Disneyland California. If you are on a tight budget, we can suggest some other hotels within easy walking distance of Disneyland. For a special occasion, or if money is not a concern, go ahead and splurge - treat yourself to a stay at one of the Disneyland hotels. Discount Disneyland Tickets - Save up to $15 per ticket or 29% on vacation packages. 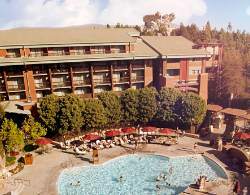 The Disneyland Grand Californian hotel, also called the Disney Grand hotel, is the most expensive of the Disney California hotels. The Disneyland Paradise Pier Hotel is the least expensive of the Disney hotels, and the original Disneyland Hotel is priced in the middle. All 3 of these downtown Disney hotels have the advantage of location location location, and some extra perks such as an easy monorail ride to the Disneyland parks, and enhanced Disney experience. If you are looking for less expensive hotels near Disneyland, see our list and map of cheap Disneyland hotels and Disneyland area hotels. 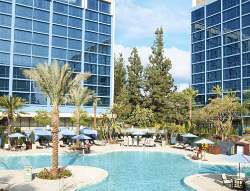 The original Disneyland Hotel, Anaheim, CA is remodeled and offers nice rooms, pool, water slides and location!. It has a AAA rating of 4 stars. It is conveniently located in downtown Disney near the exclusive monorail entrance to Disneyland. The Disneyland Paradise Pier Hotel offers a more moderate (but still expensive!) price. It has a AAA rating of 3 stars. Some rooms offer views of the World of Color show, and you can see the evening Disneyland fireworks show from the pool deck. For specialty dinning, spa treatments, and themed pools, you might want to consider this Disney Grand hotel. AAA rating of 4 stars, it shares the great location as the other downtown Disney hotels. Looking for a Cheaper Disneyland Hotel Anaheim CA? 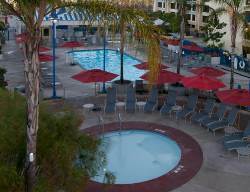 Are you looking for cheaper Anaheim hotels near Disneyland California? There are many other choices to offer. Here is an idea of what you might save. Ramada Inn Maingate - $758 - Save $856 or 53% of the price of a stay at the Disney Grand Hotel!